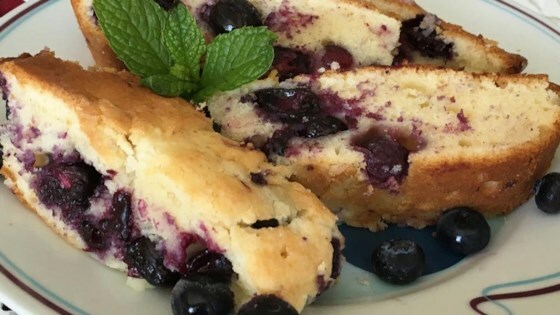 "This is an adapted recipe of blueberry pound cake that I've tried. It was a huge hit with my familia and has a sweet-but-not-too-sweet flavor with impeccable texture. Serve hot or cold." Preheat oven to 325 degrees F (165 degrees C). Coat a 9x13-inch pan with butter. Beat butter and ricotta cheese together in a stand mixer fitted with a paddle attachment until creamy. Add sugar and sucralose sweetener; beat until smooth. Add eggs one at a time, mixing well until each is incorporated. Mix in vanilla extract and almond extract. Whisk flour, baking powder, and salt together in a bowl. Slowly mix flour mixture into butter mixture. Fold blueberries gently into the batter. Bake cake in the preheated oven until edges are golden brown, 25 to 30 minutes. Continue baking until the center is set and a toothpick inserted into the center comes out clean, 50 to 75 minutes. Substitute 2 cups fresh blueberries for the frozen blueberries, if preferred. I love Starbucks so I had to make this pound cake. I loved the taste of it so much. Definitely 5 stars! didnt use splenda and increased white sugar to 1 and 1/4 cups. I also eyeballed the blueberries. Yummy, more like a crumb cake but the bomb!